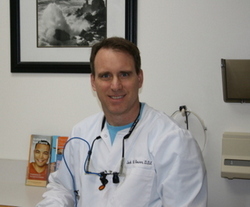 Implant dentistry evolved from general dentists. In the 1940’s, a general dentist developed the concept for implants to replace a single tooth. Today, dental implants are very predictable and successful. The dental implant is clearly the best choice for tooth replacement in most situations. The single tooth implant exhibits the highest survival rates of any other option presented for single tooth replacement. Dental implants are made of titanium and are surgically placed into the jawbone to replace the roots of missing teeth for the attachment of teeth or dentures. Through a process called “osseointegration”, the jawbone actually attaches itself to the implant over time, providing tremendous stability and natural function. Before– This patient is missing his upper front tooth. During– A dental implant was placed by Dr. Jack Hosner of Portage, MI and a zirconia abutment was screwed into the implant. After– This picture shows the final porcelain crown cemented over the abutment. 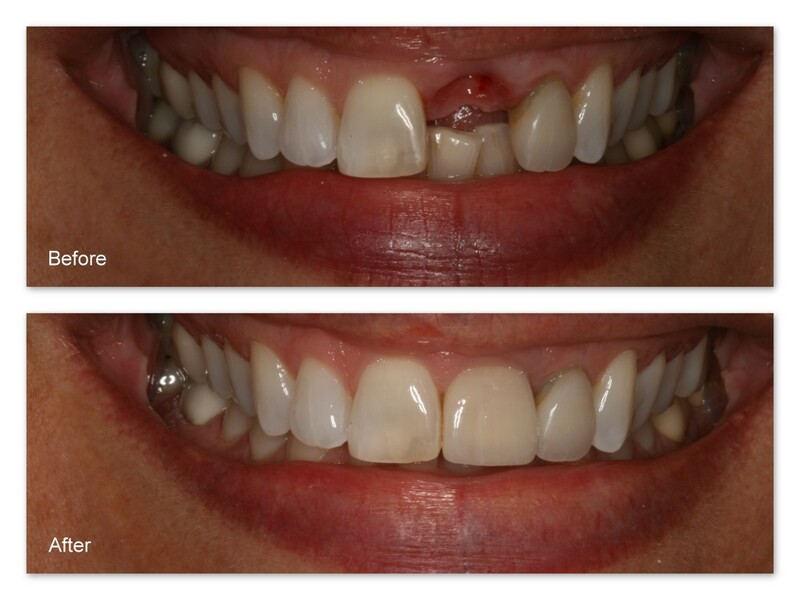 Before- This patient is missing her upper front tooth. 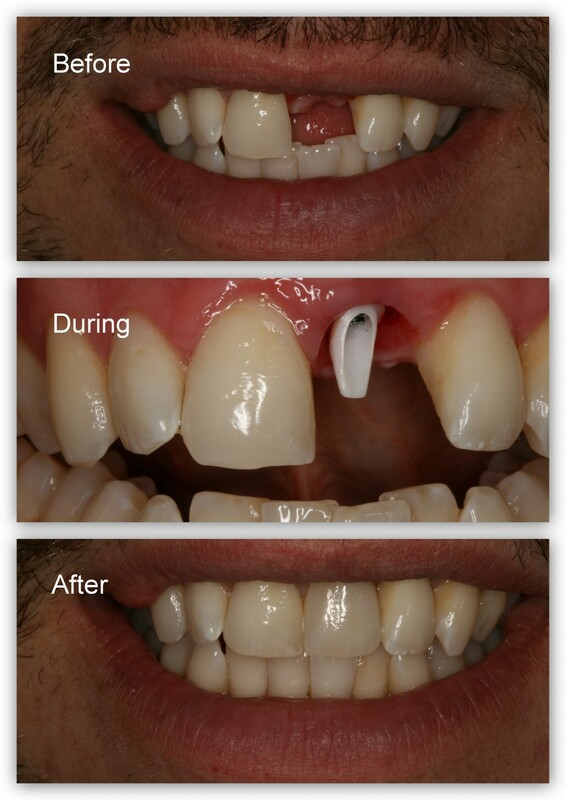 After– Dr. Jack Hosner of Portage, MI placed a dental implant and restored it with a porcelain fused to metal crown. 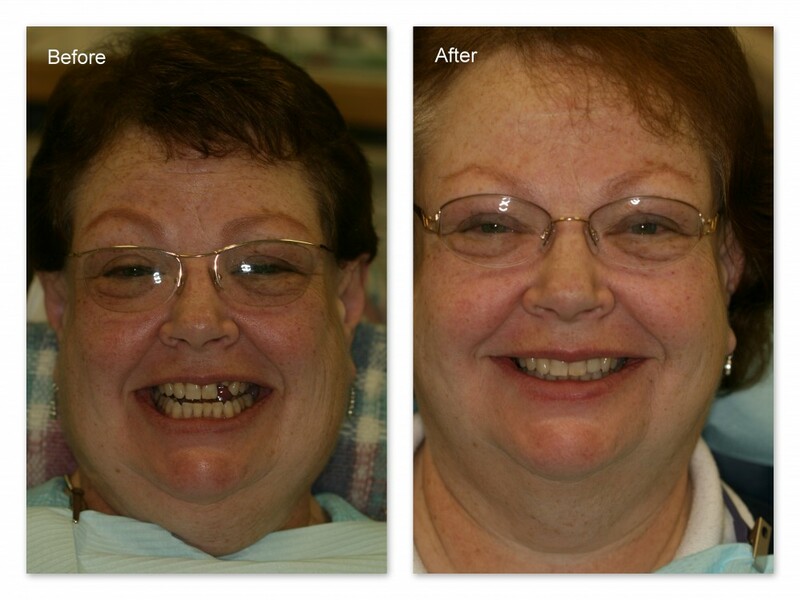 After– Dental implant was placed and restored with a porcelain crown by Dr. Jack Hosner of Portage, MI. This patient of Dr. Jack Hosner’s from Portage, MI is missing an upper back tooth. Implant– The implant Dr. Hosner placed. Abutment– The abutment which is screwed into the implant. Crown– The final crown cemented over the abutment. Before– This patient is missing a tooth. After– The final porcelain fused to metal crown has been placed.